Given that I’ve not touched vSphere 5.5 yet, I thought I would try and upgrade some of the VMware components within my company’s solution centre…. and the easiest component to upgrade first would be the VCA that I deployed to run as my test DR environment. Anyways, so my old VCA was running 5.1a and I wanted to do an upgrade of it to 5.5. Fired up a browser to the management page – http://vca-ip:5480 – and tried to do an update via the VMware.com repository….. unfortunately there wasn’t an upgrade option available to go to 5.5 (only to upgrade to 5.1b)…… pants….. So I navigated over to the VMware product download pages to try the get hold of the zip bundled update…. only to find there wasn’t one available… double pants…. So the only option I had was to deploy a brand new version of VCA and then go through the upgrade wizard from within the new VCA. Having never done this before, I thought it would be a messy process….. strangely enough it was very easy! 1. 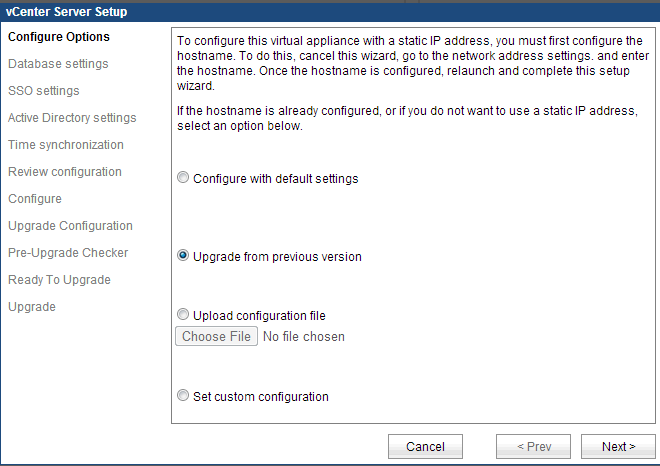 After deploying the new VCA, the wizard allows you to select “Upgrade from previous version”. What this does is connect the new VCA to your old one, and pull over all the old configuration details (like Network)… it looks as if the wizard also pulls over stats and logs as post deployment I can still see all the old tasks and event. 2. 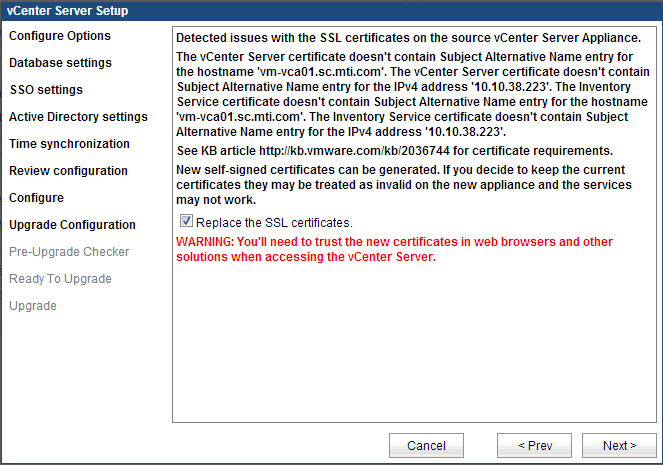 In order to setup the connection between the two VCAs, you need to configure the SSL certs so that they trust each other. 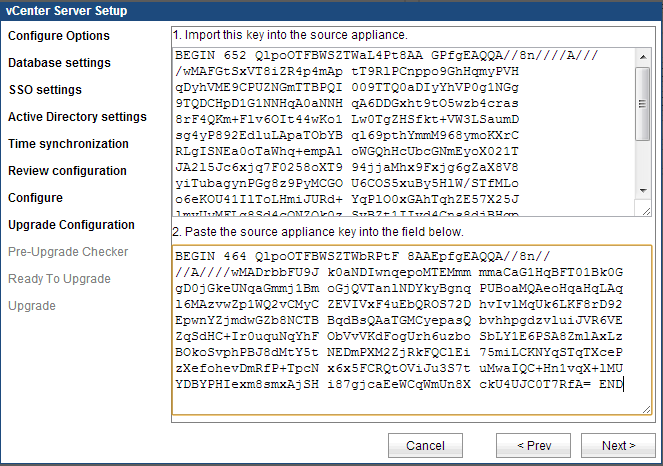 Copy the key from the new VCA. 3. 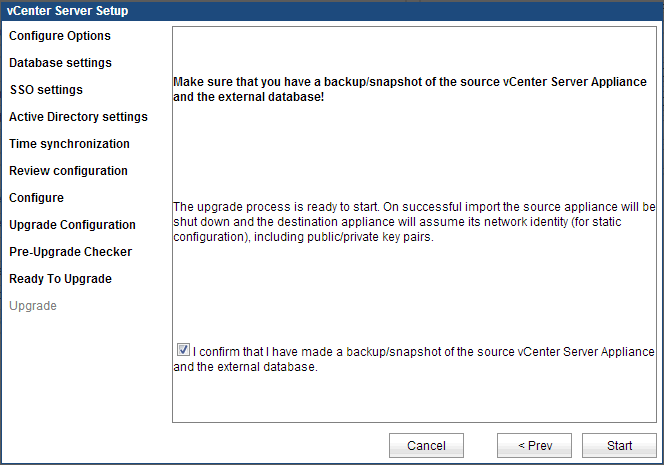 Open up the management console of the old VCA, browse to the Upgrade tab and paste the new VCA key into the window and click “Import key and stop vCenter Server”. Once the import is successful, the old VCA will generate its own SSL key which you need to cut and paste into the new VCA. 4. Paste the key generated by the old VCA into the second field and click Next. 5. The setup performs a check on the SSL certificate of the old VCA. If problems are found, the Setup wizard explains the problem and provides an option to generate a new self-signed certificate for the new VCA. Since I’m not using a CA-signed certificate, I’m quite happy to replace the old cert with a new self-signed one. 6. 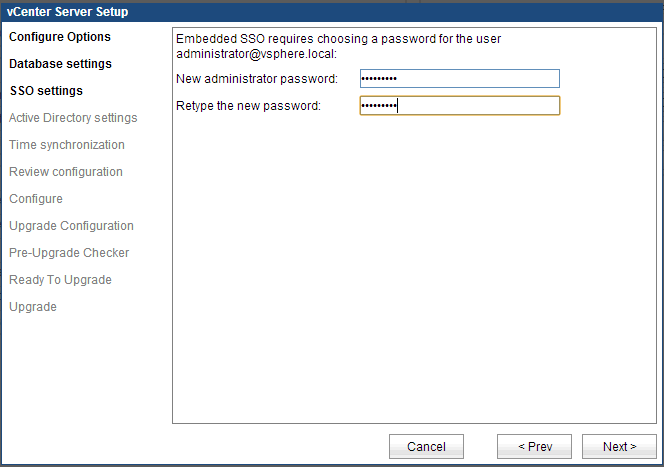 One of the big changes with SSO is the administrator account has changed. 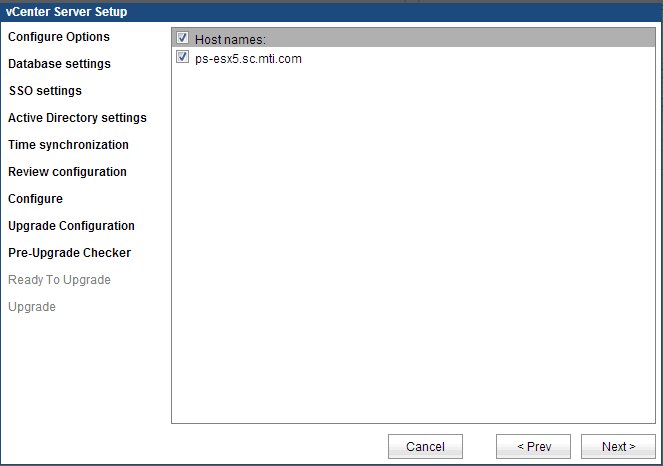 Whereas previously this was admin@System-Domain it now becomes administrator@vsphere.local. 7. Review the list of hosts managed by the old VCA and ensure you select the hosts you want to be managed by the new VCA. 8. 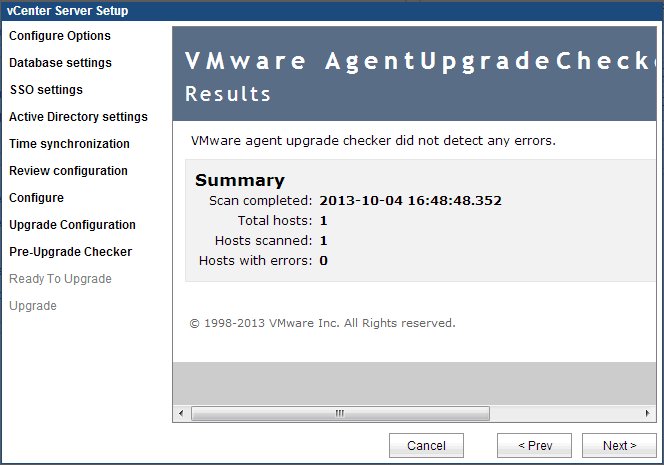 Upgrade Checker will run automatically and generate a report with any errors it detects. 9. Click Start and sit back, relax and count some chickens as you wait for the upgrade to complete. It took about 15mins for my upgrade to complete, but that could be due to the small environment being managed by the VCA. Next up, an upgrade to SRM 5.5…….